As you might have heard by now there were was a lot of news about the NHL coming to Seattle over the weekend which stem from two articles by Geoff Baker of the Seattle Times. The first article stated that the NHL has no plans to expand to Seattle right now due to the lack of an Arena plan and the second article states that that prospective Seattle NHL Franchise owner Ray Bartoszek is looking at revamped Key Arena as a potential site for a future NHL team. Both articles are worth the read because there will be several good details I will leave out. As the original Geoff Baker piece states, Ray Bartoszek is looking at other options which includes a KeyArena remodel. It is great to see Bartoszek looking at other options, instead of waiting for the NBA. By the looks of it, the NBA won’t be expanding in the next 5 years so it only makes sense to explore alternatives. I do not know if the Key is an option but I don’t think Ray knows either but we will never know unless someone looks into it. Meanwhile there appears to be a completely separate group poking around Bellevue at the viability of an arena over there. As you might recall, Don Levin was looking over there about 3 years ago but called off the hounds when it appeared Hansen grabbed the momentum with his SoDo site. It is not clear if Levin is part of this group looking at Bellevue. This should be another good sign there are people interested in this area for a team. I will never forget the Don Levin quote that the “Seattle market is like San Jose on steroids.” The NHL and prospective owners know there is something special about this market and it almost seems like they are waiting for us before expanding. Stay Positive. 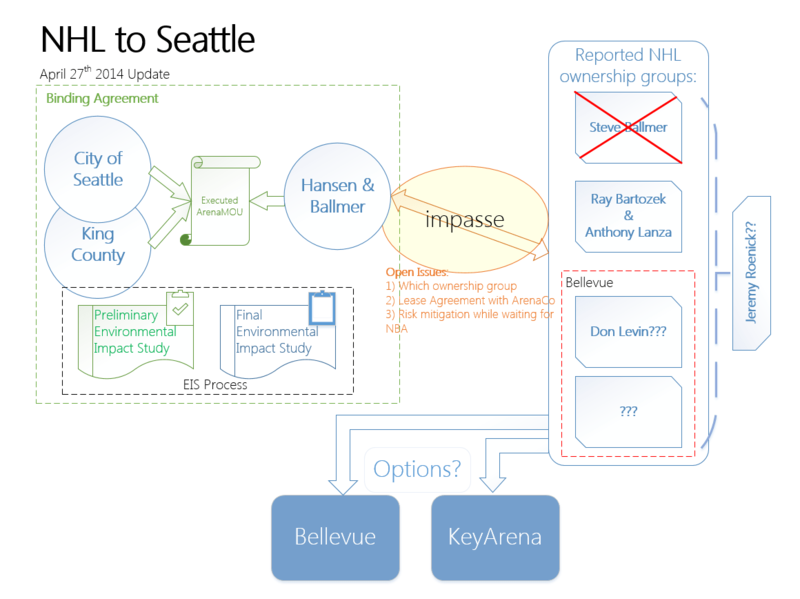 If Bartoszek presumably couldn’t show the city, nor Hansen/Ballmer the kind of equity to justify jumpstarting the SODO arena, what makes him think that he can finance a rebuild of the Key, which will very likely cost close to as much as building the SODO one? I admire his efforts greatly as one who wants the NHL in the Seattle area in the worst way, but has he done his homework on not only the costs of doing a rebuild, but the politics of arena and stadium construction in Seattle with all the obstacles of city council indifference, sports hating, and nimbyism? I hope the group looking at Bellevue/Eastside knows that in all likelihood, whatever they come up with for an arena will be dead on arrival unless it is privately financed like the Pepsi Center. I plan on going to the 2nd annual hockey hangout at the angry beaver. I hope there is more info by then on the revamped Key plan, on paper it looks like you would have to gut it out like they did in the mid 90’s, but I am by no means a Archetect so we’ll see. I think a revamped Key Arena or possibly Bellevue are the best options for bringing the NHL to the Northwest. We have seen already what has happened when hockey has been tied to an NBA proposal. The last time Ackerley intentionally designed the Key Arena to prevent the NHL from coming to Seattle. Based on Hansen’s latest actions, I am not convinced his approach has the best intentions for the NHL. Gary Bettman coming out with his statement is a clear sign the NHL wants to come to Seattle, it just needs a building. I think Replacing the lower bowl with a hockey specific design centered in the building would be a great solution. What is unknown is if the upper bowl sight lines will work with that scenario. It seems to me that if King County would release the $100 million it has on hold for hockey in the new Sonics Arena plan and allow it to be used on Key Arena, along with naming rights money and some contribution by the team owner, you could come up with enough money for a large renovation that would seat 16k to 17k with unobstructed view. Below are Gary Bettman’s latest comments on expansion and Seattle. These quotes come from NESN sports network. I think it is very important to note that Gary doesn’t initiate comments like this normally. He is loathe to give any positive comments on potential expansion, Understanding Bettman you need to parse very carefully what he says and doesn’t say. He is a master of implying one thing and meaning another. In this quote he is very clear the NHL has strong interest in Seattle and wants the arena issue resolved. Here are his thoughts on Quebec City. He has never given a positive hint towards this possible expansion location and in fact regularly says just building an NHL facility is not enough for a franchise. Again note, the language he uses, it is clear where he stands on Quebec City. Lastly here are his comments on Las Vegas, again note he is not giving any positive vibes to LV. He brings up the gambling and that is nice the folks there want to build a facility, but basically is saying good luck with that. When you contrast these with his Seattle remarks you know the NHL has a very different perspective on Seattle. Excellent insight Drew. I had a similar reaction when I read the article. The most interesting thing I thought he said is around Vegas, where he called out the “people who go there to visit”. Its almost like the NHL is waiting for us and then will determine another dancing partner when that happens. Assuming the economics are there for another team in the west, I think the NHL keeps QC on standby for any teams that start to falter. That could be Phoenix, Florida or who knows. (To be clear, I am not rooting for a relo situation but we all know this happens from time to time.